Agostini Associati`s expertise includes translations from English and Italian to Russian and vice-versa for the mentioned language pairs. In addition we offer translation in 60 other languages. Our expert Russian native speaker translators and interpreters are qualified in translating the most complex documents that include: marketing brochures market, legal documents and annual reports, and technical documents for the Russian market. We invest in the development of our knowledge base within the Russian language and culture in order to successfully follow many of our clients’ long-term investments and interests in the energy, design, furniture and fashion sectors. The Russian language, because of its Cyrillic alphabet and Slavic origins, requires a level of knowledge that only a native speaker translator is capable of ensuring. The high level of professionalism that our translators provide is evident through our association and collaboration with the Italia-Russian Chamber of Commerce. If you need an urgent translation into Russian or from Russian, Agostini Associati has the language expertise through its extensive network of native speaker translators. If you have a last minute need for an interpreter in Milan, Turin, and Rome (the surrounding areas as well) or for an English/Russian or Italian/Russian interpreter in Russia (Moscow and Saint Petersburg) we have interpreters available to help you with your language needs. Request a personalized free estimate today for professional translations from English to Russian or Italian to Russian and vice-versa for both language pairs. If you also have frequent need for certified translations in the mentioned language pairs, contact us and ask for our annual offer that provides you with competitive prices and other advantages. The Russian language has some similarities with Germanic languages, for example there are 3 genders (neutral, masculine, and feminine) in which the English and Italian languages do not have. Still observed are some differences marked within the Germanic and romance languages that include: the Russian language has 6 cases (падежи) instrumental, propositional, nominative, genitive, dative, accusative (the last four are the same in German). The Cyrillic alphabet, old relative of Glagolitic that was used in the 9th century, is today used within the diverse Slavic languages (Russian, Belorussian, Bosnian, Bulgarian, Serbian and Ukrainian); and in terms of volume it is the third alphabet in the EU. Above you can find a photo of a keyboard used by our Russian translators. Within the modern Russian language there are 33 Cyrillic letters. 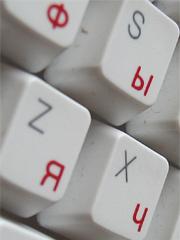 It is fundamental that your Russian translators and interpreters be native speakers and that they possess all the necessary instruments for quality Russian translations, beginning with a Russian keyboard (not an English or Italian keyboard with the Russian letters attached as the risk for error increases). 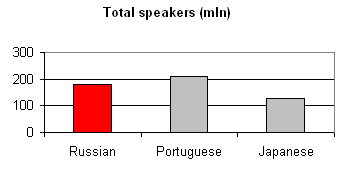 Total number of speakers: approximately 180 million people, with an estimated 140 million residents in Russia. 80% of the Russian population lives west of the Ural mountains. Spoken in: Russia, Ukraine, former-Soviet Union states. Also significantly spoken in Mongolia, the United States, Czech Republic, and Israel. Remember that Russia has a immense territory where 11 different time-zones may be found. If you are seeking for more visibility within the Russian market, you should consider both a localization and optimization plan for your Website for the search engines Yandex and Rambler. Also, important to remember is that the social networking site of Facebook Russia is virtually nonexistent, while a local Russian social networking site “Vkontakte” dominates. If you would like more information on how to approach your Website visibility within the Russian market, we recommend the company Bruce Clay. Ethnologue Volume I: Languages of the World, 16th ed.